Last week, I went to a great talk by Alex Semenzato, who works as a Business Development Manager at Cortexica and is founder of FashTech. In his talk, Alex explained about the visual technology as developed by Cortexica. He discussed this technology in the context of fashion products, making the case for how visual search can really change the way we find out about fashion products and trends. Find similar – The main proposition behind using Cortexica’s findSimilar™ software is that “you can shop any look just by taking a picture”. 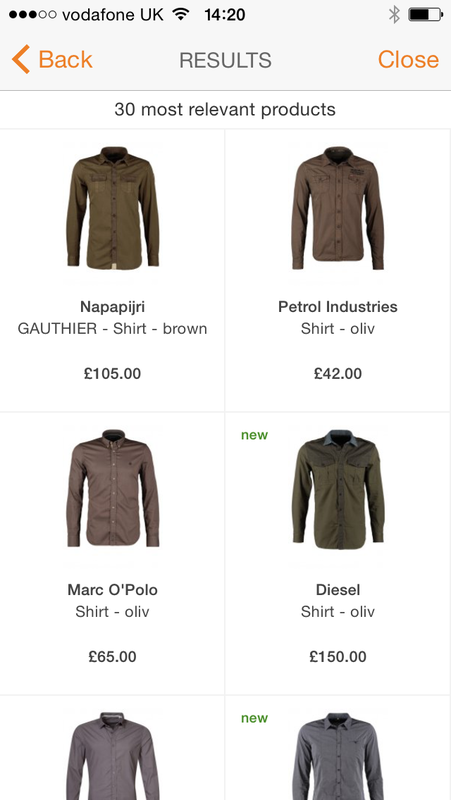 Users can take a picture on their mobiles of a design pattern or look that they like and use the visual search functionality on the client app to find either the exact item, or the most similar option(s) within the retailer’s database. One big caveat though: the quality of your visual search results is very dependent on the products available in the database of the retailer whose app you’re using. For instance, when I did a visual search through the Zalando app, the most relevant results that the app returned didn’t get close to the look that I was searching for (see Fig. 1 below). 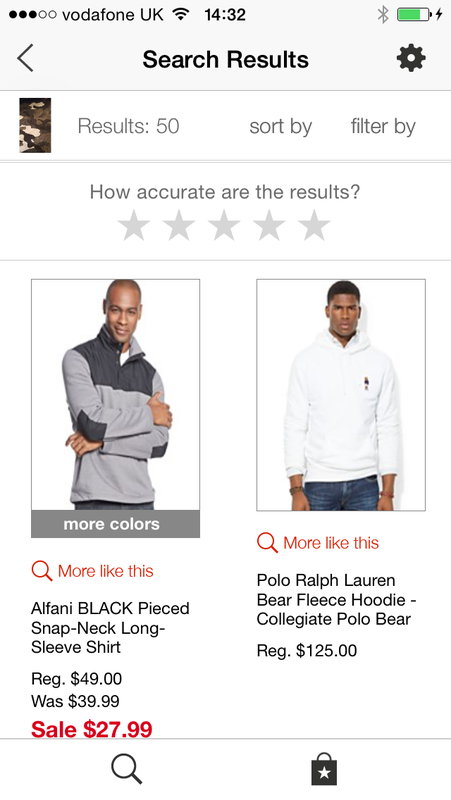 In comparison, the results that the Macy’s app returned already felt more relevant (see Fig. 1 below). Matching – Alex explained that the matching between user’s pictures against fingerprints in the retailer database takes into account things such as colour pattern, texture and – eventually – shape. The technical challenge is to really get this mix right when doing the matching against available items in a retailer’s database. 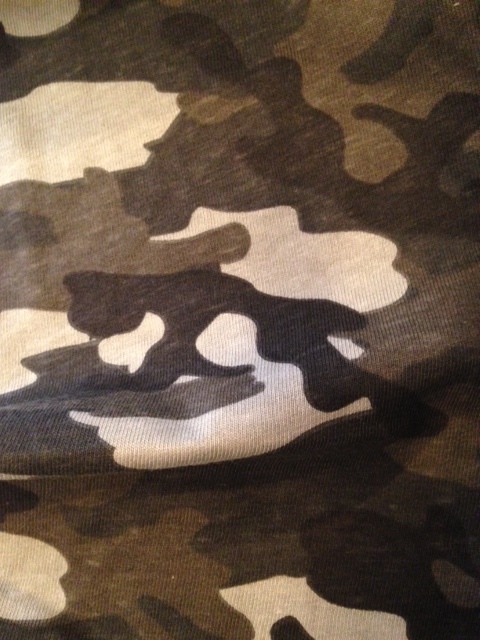 For example, the search technology needs to understand the different textures that a fabric like denim can have. It will be interesting to see how Cortexica’s competitors such as Snap Fashion, Chic Engine and ASAP54 compare in this respect. Big data – In his presentation, Alex talked about potential B2C opportunities around Cortexica’s visual search capability. “Big data” was the first thing that he mentioned. Sometimes it feels like I can’t go to a presentation without at least one person mentioning the words “big data”, but it being able to measure makes a lot of sense in the context of visual search and fashion. One could use the analytics around products searched for (and bought) to gauge demand and to aid with product on-boarding. However, as a member in the audience rightly pointed out; the value of past data can be quite limited in the world of fashion, where it’s all about today’s trends. Alex talked about using the data generated from visual searches also in relation to merchandising solutions, associating similar items with the main product that one wants to promote. Things to watch out for – With the previous point about data opportunities come questions around data protection and data ownership. I would like to find out more about visual search and aspects like data usage and ownership. Think about questions such as “can I just use the data generated from ‘street style images’?” and “will the retailer own the images that I took and any associated data?” which I’d love to get answers on. Also, I wondered – after having had a play with the functionality – how to get the user experience around visual search right, especially if users don’t discover the type of product or look that they were looking for. For example, how do you keep users engaged if their retailer or publisher app doesn’t return the desired results? Main learning point: I really enjoyed Alex Semenzato’s talk about the visual search capability as developed by Cortexica. It seems like a very logical and intuitive way to discover new products and I can see the visual aspect working particularly well in relation to fashion products. Given that this is a relatively new technology, there are few things which still need to pan out: the use of data and the overarching discovery experience for the user. Cortexica has definitely created and interesting piece of technology which can benefit both consumers and retailers alike. They have a different approach at some point than Cortexica or similars. Let’s see how this is moving forward!